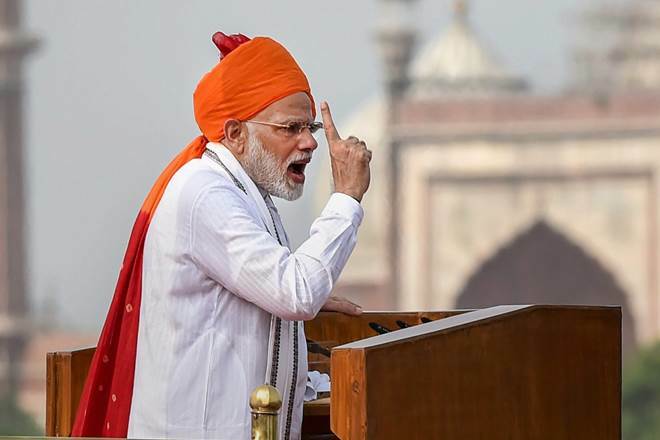 PM Modi at the BJP’s national executive meet coined a new slogan setting the tone of the campaign for Assembly polls and 2019 Lok Sabha elections; displaying his party’s eagerness for a redecorated narrative. Prime Minister Narendra Modi delivered the valedictory speech to conclude the two-day national executive meeting of the Bharatiya Janata Party in New Delhi on Sunday. PM Modi gave a new slogan of ‘Ajay Bharat, Atal Bhajpa’ at the meeting to kick off its campaign for the 2019 Lok Sabha elections. BJP is looking forward to riding the wave of Atal Bihari Vajpayee’s popularity, as clear from the new slogan and the ‘Asthi Kalash Yatra’ held before. The recent sighting of other BJP politicians’ posters at Delhi’s Janpath shows the party’s eagerness to cash in on the inclusive politics of Vajpayee to refurbish its own image. The meeting with the theme of ‘Sadaiv Atal’ was held at Dr Ambedkar International Centre just after the protests against the amendments to the SC/ST Act. According to Mark McKinnon, chief strategy and media advisor to former US president George W. Bush, it is the story of a politician that wins the nation’s votes. People tend to favour the political candidate who comes with the best narrative. BJP is looking forward to replacing its hardline Hindutva stance with a more inclusive and progressive one; a campaign that includes other politicians of the party and not just the Modi-Shah duo. Although, this seems to be another political move with a visual marketing strategy for a party whose ideology stems from the Sangh. Humans process messages in one of two ways: ‘centrally,’ where the message is scrutinized and evaluated critically, or ‘peripherally,’ where the message is absorbed casually. The judgment, in the latter, is less by its content than by the appeal of the speaker or receiver’s mood. To get people to change their opinions, the information must be processed ‘centrally’, as peripheral processing does not have lasting effects. There is also a third route of immersion by which a message is processed. Immersion in a story compels the receiver to experience the events and emotions in the message. In a series of experiments conducted by psychologists Melanie Green and Timothy Brock, subjects read a story about a child murdered in a mall by a psychiatric patient. Afterwards, they answered questions designed to measure their absorption in the story. Participants were also asked their views on issues relevant to the story, for example, about freedoms for psychiatric patients and their beliefs in a just world. Readers who scored highly on the absorption scale were likely to report beliefs consistent with those implied in the story. Subjects were also asked to circle every ‘false note’ or statement that they find false in the story. The more absorbed they were, the less likely they were to see such false notes. This suggests that when we hear stories, we suspend our tendency to counter argue, to raise doubts about the truth or relevance of the information we’re hearing. Prof. Robert E Scholes, the American literary critic and theorist, defines the word ‘narrative’ as “all those literary works which are distinguished by two characteristics: the presence of a story and a story-teller.” He calls the competing narratives of actual events as ‘spin’ and ‘spin doctoring’. PM Modi’s rhetorical technique is that of a populist. His uses of words like ‘brothers and sisters’ and third person singular show his emphasis on storytelling and personalization of power. He has mastered the art of forming a narrative by spoon-feeding stories to the masses. His criticism of his opponents and the utopian promises he makes can be seen as a form of a litany; the latter of which can be overruled as just ‘jumlas’. After all, this is how a story is told. Savarkar called Mussalmans “Mlenchas” in his Book — Let RSS condemn Savarkar first — “Mlencha” means foreigners who came from outside of india and it also used as a derogatory term in India in the sense of “impure and/or “inferior” people who are basically “non-Vedic” or “barbarians”.